5300 Poplar Tent Road, Concord, N.C.
Dr. Steve Ayers delivers the message “Let Them Come” with scriptures from Psalm 26 and Mark 10:2-16. The Rev. Darryl Jefferson is the Deacon of the Week. He will read the Old Testament scripture and have the morning prayer. The Finance Committee will meet on Tuesday to begin the process of preparing the budget for 2016. Please bring your request if you are a committee chairman at 7 p.m.
J.O.Y. Club is on Thursday, Oct. 8, at 11 a.m. Come and bring a friend and enjoy the food and fellowship. Marys and Marthas Ministry will meet on Oct. 8 at 6:30 p.m. for a pot lunch supper and fellowship. The Youth will go to the Amazing Maize Maz after Sunday School on Oct. 11. They should return around 4 p.m. See Paul for more details. 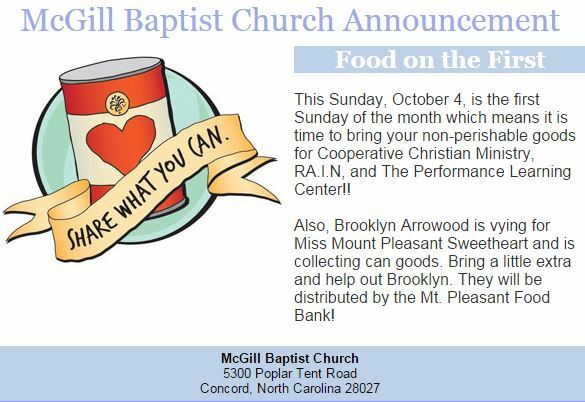 The CROP Walk is Sunday, Oct. 18, at 2 p.m. at Forest Hill Methodist Church in Concord. Donor packets will be available in the back of the worship hall. If you cannot walk please find someone that you can sponsor.